The major commercial, financial and transport hub in Texas, USA. In terms of dark tourism the city is an important destination due mainly to the legacy of one the highest-profile assassinations in history, that of President John F Kennedy in 1963. The site and associated museum are premier tourist sights in general and amongst the most widely discussed in academic dark tourism research. What there is to see: Dallas as a city isn't the most alluring by any standards and wouldn't be with regard to dark tourism either, if it wasn't for one the world's premier dark museums: the Sixth Floor Museum at Dealey Plaza, from where JFK was shot by Lee Harvey Oswald on 22 November 1963. Round the corner from Dealey Plaza is another museum of dark appeal, namely Dallas's own incarnation of a Holocaust museum. The JFK assassination is commemorated not just around Dealey Plaza itself (described in the Sixth Floor Museum entry under 'dark combinations') but also on a separate John F Kennedy Memorial Plaza two blocks further into downtown. It only features a rather cold and stark whitewashed concrete monument, but can just as well be taken in too when in the area anyway. Location: in the centre of north-eastern Texas, USA, some 220 miles (330 km) south of Oklahoma City to the north and a bit more than that from Houston in the south. Access and costs: easy to get to, not necessarily cheap. Details: getting to Dallas from virtually anywhere else in the USA and even from abroad is easy thanks to Dallas/Fort Worth International Airport (DFW), which is one of the largest and busiest in the world. Apart from being the home of one of the States' principal airlines (AA) it is also one of the major international gateways to the US, with connections to Europe including direct flights to London and Paris. In addition, Dallas also has a second airport, Love Field, for yet more domestic connections. Texas is so big that flying even makes sense within the state. But as an alternative there are also trains – including one (ironically) called The Heartland Flyer, which uses a revived part of the former Chicago-Houston line, though trains now only run between Fort Worth and Oklahoma City. Otherwise, the car is of course king in oil-thirsty Texas and a host of Interstate highways intersect in and around Dallas. Within central Dallas it's best to just walk. Public transport to cover greater distances within the city includes buses and even tram-like light railway lines, as well as fast connections to Fort Worth. Dallas/Fort Worth is an extremely sprawling conurbation, and outside the very centre everything is miles apart, so most people drive around in cars. Accommodation-wise, Dallas obviously covers the entire range, from cheap and grotty to swish and expensive. One classic old dame of a hotel is the legendary Adolphus, though rooms can be far less grand than the exterior or the lavishly wood-panelled lobby and gourmet restaurants. Food-wise, carnivores will be in their element, with BBQ and the famous Texas Chili (no beans or tomatoes, i.e. very different from the global chilli con carne!!!) being treasured as "national" dishes, while vegetarians are almost openly looked down upon (in one souvenir shop I found this corruption of the acronym PETA: "people eating tasty animals"!). Stylistically Tex-Mex is predictably omnipresent, and in some cases is taken to unexpected culinary heights – as I found in a relatively new place called Wild Salsa – which is a cool place for chilliheads like me who don't want it meaty at the same time … and the spiced-up Margaritas were amongst the best I've ever had anywhere. Time required: a day is plenty enough for the dark sites outlined above. If you also want to take in other Dallas attractions, add another day or two perhaps. But more days would really be more than can usefully be filled. Combinations with other dark destinations: none in the immediate vicinity – the closest other cities with dark sites in them are Oklahoma City to the north for its National Memorial & Museum or Houston further south for its funeral museum. Albuquerque to the west, home to the National Nuclear Museum, and Memphis, Tennessee with its Civil Rights Museum, are also within relatively easy reach (by south-western US standards) either by domestic flights (ca. 1-2 hours) or a day's drive. Otherwise see under USA in general. There was one more quite unplanned but still very dark element of my recent visit to Dallas: the tornadoes that hit the area on 3 April 2012. In fact I should already have left when they hit. My plane was sitting on the runway approach at Dallas Ft Worth airport waiting to get clearance for take-off – which was delayed due to a snow storm that put the electronic guidance systems at the destination, Albuquerque, temporarily out of action. And then the storms at Dallas itself developed into really severe weather. The captain calmly announced that there were several tornadoes in the area so we couldn't fly – and that the airport tower had been evacuated due to the tornado warning anyway. So we got stranded out there. OK, but what if one of those tornadoes actually hit our plane? Would a plane withstand such forces? And even if it did withstand the wind speeds (planes are built for that by nature, after all), it would offer little protection against flying debris – which is always the main cause of casualties in tornadoes, when glass, wooden planks, and even objects as heavy as trucks are thrown around by a tornado. But in the end we were lucky. The tornadoes narrowly passed the airport by. Our plane did, however, get pelted with hail – golf-ball sized and larger! The noise inside the cabin was deafening. Needless to say, all planes had to return to gate after this as the dents in the wings caused by the hail would have disrupted the smooth over-wing airflow necessary for safe flying. Back inside the terminal building everybody was ordered to stay away from the windows and take shelter behind concrete walls or in the toilets which doubled up as dedicated tornado shelters (all the passengers from Oklahoma and Kansas were already in there … they are more familiar with tornadoes than Dallas is!). All air traffic into and out of Dallas was suspended for the day, so we had to spend the night there … and even next day hundreds of flights were cancelled. At least we had escaped the tornadoes unscathed though – unlike many others in the Dallas area as we later saw on the TV news. The tornadoes had levelled several buildings and tossed heavy trucks about like paper doves. At the time of the reporting it still looked like no one had been killed, miraculously … though it later became known that there had been casualties after all. I didn't actually see any of the tornadoes with my own eyes from the grounded plane, but I can tell you it was quite an uneasy feeling knowing they were so near. I had never been so close to such destructive weather before. So it was kind of a dark extra to the trip. However, it can't really count as dark tourism, given it wasn't intentional that I found myself in this weather situation (had I known about it I would have avoided it!) – and the tornadoes wouldn't have left any visitable dark sites either. As is usually the case after such natural disasters, all damage would swiftly be repaired. So I'm just reporting this story for entertainment … that's what everybody at the airport was saying: at least it'll give us something to tell people back home! So I've done my bit and relayed this little adventure story to you too, here on my "homepage". 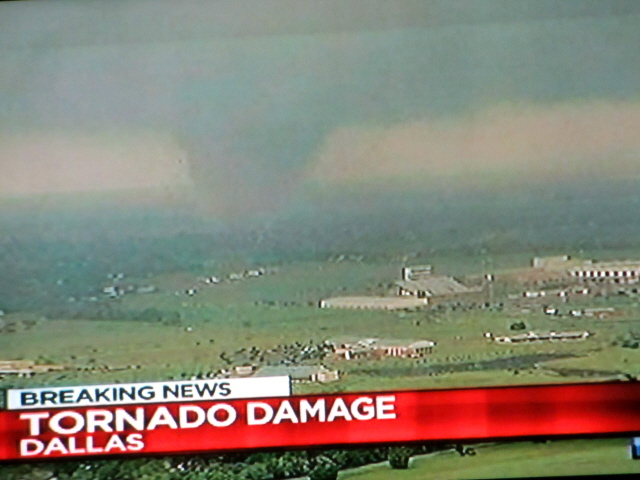 The last image in the photo gallery below covers it too – it's from a TV screen at DFW. You can clearly make out a large-scale tornado touching down. I could have added images of the destroyed houses, but I thought that that would maybe have been too much on the voyeuristic side … (see ethical issues). Combinations with non-dark destinations: Dallas isn't one of the USA's most touristy cities, nor is it especially pretty. Its downtown does boast a number of remarkable sparkling skyscrapers, but it's rather the somewhat older buildings that steal the show. Amongst them are two hotels: the particularly ornate Adolphus, and its less ornate but taller neighbour, the Magnolia. Close to Dealey Plaza the Old Red Courthouse is a museum now, and doubles up as the tourist information centre too. Just south-west of downtown, the Reunion Tower attracts visitors for the views from the observation decks at the top (even though there are better views to be had in the world). And the revitalized historic West End district is now a recreation and shopping area. Deep Ellum is the name of the entertainment district to the east of downtown – famed for blues music venues and boasting many restaurants and artsy bars, as well as a couple of microbreweries. When I went in the afternoon, however, I found the area rather "dead" (very dead, in fact). Maybe it only comes to life after dark … the beer was good, though.